We present the prizes and certificates to those that took part in our sponsored swim. Takes place at Brookmans Park School, Bradmore Way. Club visit to the WW2 code breaking unit. Inter-District football tournament at Burton-on-Trent. The title of Janet's talk is "Use it or lose it"
Takes place at South Beds Golf Course. Neil will speak to us about his charity The Red Rubber Ball Foundation who provide workshops and education for the poor in Kenya. 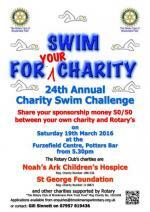 Our annual sponsored swim at the Furzefield Centre, Potters Bar. For details please contact Gill Sinnott on 07957 819436 or email enquiries@brookmansparkrotary.org.uk. Teams from Dame Alice Owen's School will compete for the final at Tilsworth Golf Club. Teams from Dame Alice Owen's School, The Sele School and Bishop's Hatfield School will compete in the District Final at Tilsworth Golf Club. Capt. McCourt will come and talk to us about the work of Trinity House. He has been a tanker and ferry captain in the Baltic and is now MD of Watkins Superyachts Ltd.
Andrew will talk to us about the Royal Navy and the Gulf. This year we will be at the Rose & Crown in Essendon. Join us to light the Christmas lights on the tree at Bradmore Green. Joint meeting with Potters Bar club at Potters Bar Golf Club. Geoff will talk to us about the "Golden Age of School Building"
David, the Global Scholar we are hosting, will come to speak to us about his studies. Individual challenge 400m, relay challenge 4x50m. Bedford Athletic Stadium. This meeting will be at the Woodman, Water End. David will speak to us about his experiences in journalism and the use of social media. This meeting will be at The Candlesticks in Essendon. An opportunity to discuss our future activities. Welcome District Governor Elect Prue Dixon and her team at Shendish Manor Hotel, London Road, Apsley, Hemel Hempstead, HP3 0AA.